Our pros are here to provide repairs, installations and much more! We go above and beyond by offering insurance claim assistance and gutter services for a well-performing roof that lasts for decades to come. Contact us today for our incredible roofing services! 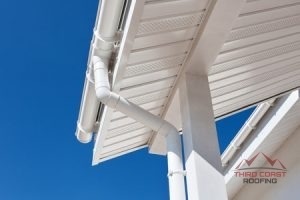 A well-functioning gutter system can add years to the life of your roof. Need help filing an insurance claim? We've got your back! We are your source for shingle roof replacement and more! Our roofers are your local authority for flat roofs. Whether you have a roof leak or you need a full roof replacement, there is no roofing company that matches the services of Third Coast Roofing. We pull out all the stops to deliver the best services possible to our customers including in-house financing for easier payment. 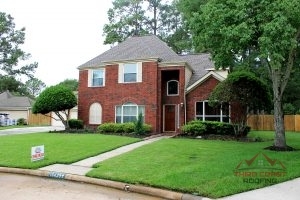 We’re proud to offer our expert roofing services throughout Houston, TX and all surrounding areas. Our company always offers FREE estimates, and all our work comes with a five-year labor warranty. Call us at 832.792.4975 for our superior roof repair and replacement services from the best Houston, TX roofer around! At Third Coast Roofing, our mission is to serve our customers by combining quality workmanship, honesty, reliability, and affordability. 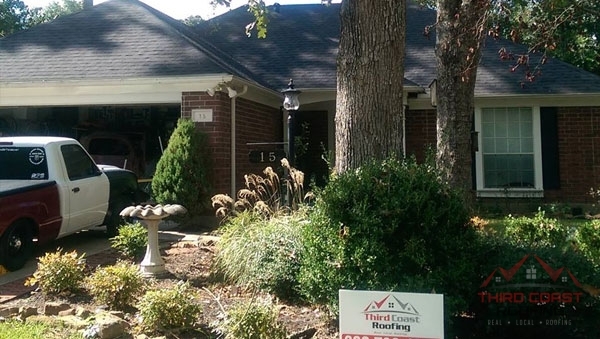 We are committed to providing 100% customer satisfaction, exceeding expectations, and meeting all your roofing needs. At Third Cost Roofing, we are proud to serve a wide area with a long list of residential and commercial roofing services. With over 10 years in the roofing industry, we are constantly keeping up with changes in techniques and materials to bring you the very best of both. We offer a five-year labor warranty on all our projects. 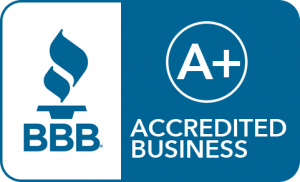 Therefore, you can be sure we will do the very best work on your roof! Call us at 832.792.4975 today for your FREE service estimate and to take advantage of our top-notch services as a Houston, TX roofer! We offer roof repairs, replacements, and installations on homes with a variety of residential roofing materials. As with any big investment that may impact the property value of your home for decades to come, it is important that you look into each option very carefully. The costs of different roofing materials vary greatly, and it is critical to factor in the long-term value of each material, along with your long-term intentions for the house, such as whether you intend to sell it in the near future or live in it for years to come. Aesthetic traits should also play a significant role in your decision, and if you intend to live there for a while, it is important to pick a style you will be happy seeing every day! 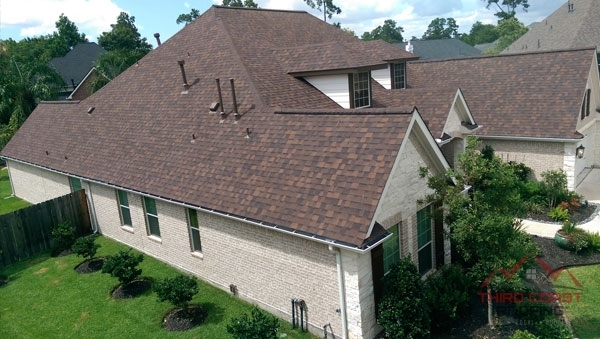 With years of experience in roofing, Third Coast Roofing is happy to provide reliable roofing installation in Houston, TX and the surrounding areas. If you need expert roof replacement services, contact the experts at 832.792.4975. Cedar Shake Roofs For a roofing material that has the added benefit of home insulation, look no further than cedar shakes. These wooden shingles add to the style of certain homes, and cedar is known to be pest-resistant. However, this type of roof needs regular maintenance in order to last a long time. As a Houston, TX roofer, we can perform this maintenance, as well as any repairs you may need for your cedar shake roof. Plus, we can install new cedar shake roofs, whether you are building a new house or your current home simply needs re-roofing. Metal Roofs One of the most durable roofing solutions, metal roofs have the longest lifespans of all the roofing materials on the market. These roofs need the least maintenance of all the roof types we serve. However, that doesn’t mean they don’t need the occasional repair. They are susceptible to rust and corrosion as well as the occasional leak. However, we can fix these issues no problem to help it last as long as possible! 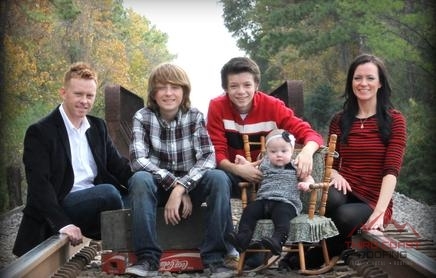 We are the Houston, TX roofer to perform your metal roof installation as well! We can make sure to install your roof correctly so it lasts its full lifespan as a protector for your home. Shingle Roofs Asphalt shingles are the most popular roofing material in the United States and for good reason. Not only is this a durable system that can last for decades, but it is also extremely affordable. These roofs are, however, susceptible to leaks and storm damage like all roofs. We can fix these and any other problems in no time! Plus, if it’s time for a re-roofing, we can perform this service with ease. Contact us today for your shingle roof services. 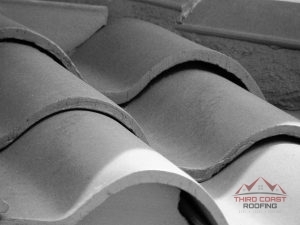 Tile Roofs There are several types of tiles, from clay to concrete to synthetic and we are the Houston, TX roofer who can both repair and replace these tiles. These tiles come in many different shapes and colors so there is a type of tile to match the style of every home. Plus, this material is extremely hardy. Ultimately, when you combine our services with the roofing material, the end result is a long-lasting roof that protects your home for decades! Emergency Roof Repair No amount of preparation can leave a roof invulnerable to catastrophic damage from a storm or unforeseen disaster. A need for emergency roof repair means that your roof can no longer accomplish its job: protect you from the elements. The most common reasons for roof emergencies all relate to the weather. High winds can combine with heavy rainfall to imperil trees around your property. Especially large hail can also inflict serious damage all on its own. Hail Damage Repair Hail can inflict anything from minor to major damage to your roof. Any hailstorm can warrant an inspection, as minor events will create an accumulation of damage over time. Signs of hail damage appear as black spots or softened areas on shingle roofs. Any hail damage presents an opportunity to roof leaks. Commercial roofing problems are no match for our roof repairs and replacements! Are you struggling with serious or continuous roof damage? 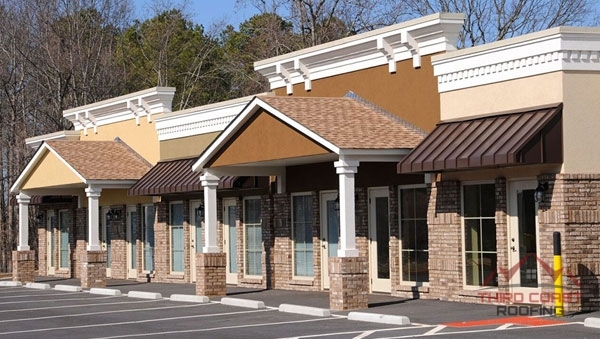 When discussing commercial buildings, many different factors can cause serious damages in a short span of time. These issues can include sagging areas that permit water to pool, and even mold and mildew growth, but many problems can be stopped with consistent maintenance. For commercial roof repair in Houston, TX that is cost-effective and reliable, count on the experts at Third Coast Roofing. Flat Roofs Although some homes have flat roofs, the most common type of commercial roof is the low-slope or flat roof. Both modified bitumen and TPO roofs fall into this category, as well as many other methods and materials. For over 10 years, our company has provided flat roof repairs and replacements as part of our services. Flat roofs are susceptible to water pooling, in which standing water penetrates the roof and seeps into the interior of the building. Luckily, our pros can make sure your flat roof is in good condition with our services! We can repair any leaks and prevent new ones with regular inspections. Modified Bitumen Roofs If you want an affordable and effective commercial roofing solution, we’re the Houston, TX roofing company to bring it to you in the form of a modified bitumen roof! Modified bitumen, or asphalt roofs, can be built up with several layers or simply consist of one layer of asphalt. Whether you need a repair or an installation, we are the best source around. Our experts know several installation methods, and chances are we can find the best one for your roof and needs! TPO Roofs Thermoplastic roofs set themselves apart from other commercial roofing systems because these are by far the most eco-friendly. They are uniquely UV reflective, which means you will not have to spend nearly as much on air conditioning for your commercial building. That’s not all, though. TPO roofs are also completely recyclable. Altogether, these roofs provide complete building protection for decades. If they ever need repairs or if you are interested in an installation, all you have to do is contact your local Houston, TX roofer to get started! EPDM Roofs EPDM roofs have represented a popular choice for commercial roofing for decades. Also called “rubber roofs,” these highly durable and impact-resistant systems also perform well in the face of frequent storms. Repairs become a cinch, as skilled technicians can simply swap out a damaged piece with another section of EPDM. Roof Restoration Roof restoration represents a cost-effective alternative to total roof replacement. If you have an old or damaged roof, the prospect of replacement may not sit well with your budget. Roof restoration becomes favorable in this scenario, as it can add 10 to 15 functional years to the lifespan of your roof. We customize all of our restoration jobs to the needs of our clients, so that you’re sure to get the most bang for your investment. Roof Replacement When the day finally comes for roof replacement, you don’t want to trust the job to just anyone. Third Coast Roofing has the skill and experience necessary to render thorough, expedient, and precise installations of replacement commercial roofs. 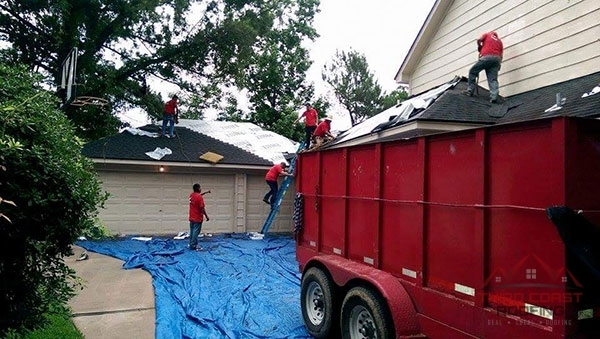 From removal of the old roofing to all the small details that characterize a stellar job, we’re the team to trust in Houston, TX and surrounding areas. If you’re looking for a roofer in Houston, TX focusing on total roof care, look no further than Third Coast Roofing! To keep your roof in top shape, our pros know to pay attention to more than the roof itself. Thus, we focus heavily on your home’s gutters. Gutters’ main job is helping water drain from the roof. They also carry that water away from the building in order to protect the foundation. However, leaves and other debris regularly clog gutters. When gutters have clogs, they don’t do their job and it begins to take a toll on the roof. Luckily our roofers can repair and replace gutters on sloped and flat roofs to help them last their full lifespan! Updated on April 18, 2019 at 4:59 pm by Third Coast Roofing.